Chops Bistro owner Tracy Syanovitz just brought a new chef on board with over 30 years’ experience working in the food-service industry. 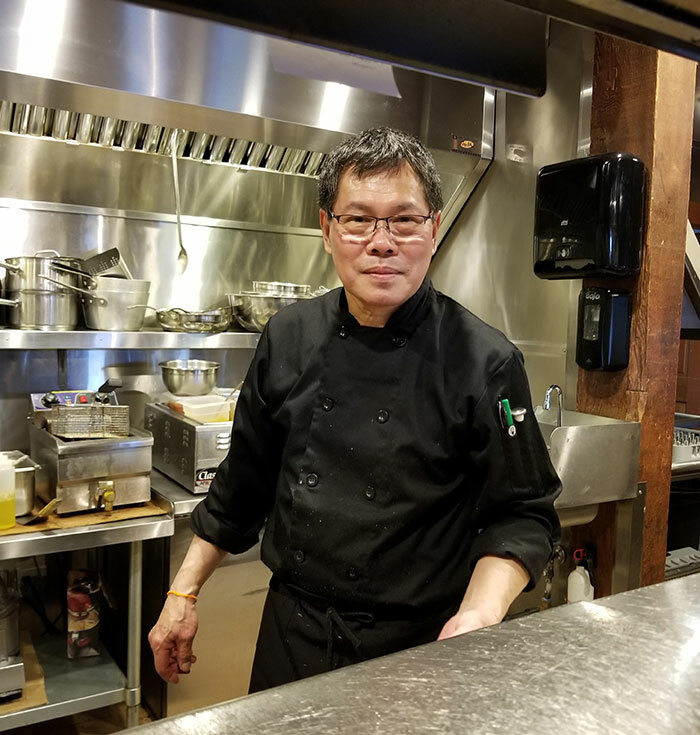 Laotian-born Jerry Phaisavath, a former Black Butte Lodge executive chef, is the new culinary artist in the kitchen at Chops Bistro. With a diverse background, Phaisavath has an impressive list of work credentials including executive chef positions at private golf clubs, resorts, gourmet restaurants and hotels. He moved to Central Oregon from the bay area in 2002, taking on an executive chef position at Bend Golf club. He was also the co-owner of Chloe, a Central Oregon restaurant known for its French American Cuisine, which closed in 2011. His food preparation training was at the Hyatt Regency in San Francisco and he feels comfortable with French, Italian, German and Pacific Northwest cuisines. “My food is inspired by the places I’ve lived and worked,” Phaisavath said. Syanovitz is excited by her new chef’s enthusiastic leadership in the kitchen and his rapport with diners. “I treat people like they are my own family,” said Phaisavath. Phaisavath also has an eye for plating and arranging food that doesn’t detract from the new, yet familiar, flavors he serves up. He has a creative style of preparing gourmet dishes, each with its own taste of distinction. With a brand-new chef at Chops Bistro, there’s bound to be a few changes on the horizon for the menu. Phaisavath would like to plan a seasonal menu including lamb shanks for spring. Chops Bistro is now serving brunch in the lounge on Sundays 11 a.m. to 2 p.m., Italian Night on Mondays and recently added prime rib on Tuesday nights. Syanovitz sent a congratulatory shout out to Chops Bistro’s server Kjersten “KJ” Vimmerstedt who just passed her Level 2 wine sommelier qualification. The Certified Sommelier Examination is the second in a series of four tests that end in the Master Sommelier title, and it’s considered to be the minimum standard for wine professionals in the service industry.